From Kathmandu, fly to Paro, Bhutan. In the 'land of the peaceful dragon,' Bhutan, your visit includes the valleys of Paro and Thimpu, the capital of Bhutan, and the picturesque Punahka and Bhuthnag valleys, Visit Tongsa Dzong and Ta-Dzong. A wonderful kaleidoscope of Himalayan cultures, religions, peoples amongst scenic grandeur. Day 1: Arrival and Transfer to the Hotel. Day 3: Kathmandu - Paro. Arrival at Paro Airport then transfers to Hotel. Day 4: Sightseeing around Paro. 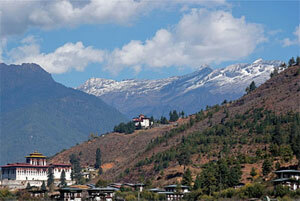 Visit Drugyel Dzong, a ruin fort, National Museum and Paro Dzong and the Handicrafts centers in Paro. Day 5: Paro - Thimpu. Drive to Thimpu and afternoon visit local handicrafts centers. Overnight at Hotel. Day 6: Sightseeing around Thimpu. A full day sightseeing and shopping in Thimpu. After lunch visit the National library and drive to Motithang. Day 7: Thimpu - Tongsa. Morning drive to Punakha. En-route stop for a lunch at Chendebji Chorten then continue to Tongsa. Overnight at a tourist Lodge. Day 8: Tongsa - Bhumthang. Visit Tongsa Dzong and Ta-Dzong. On the way you can see Jakar Dzong "castle of the White Bird". Afternoon, visit Lamey Gompa, the unsurpassed Monastery. Overnight at Guest House. Day 9: Bhumthang Sightseeing. Morning visit to Jampa Lhakhang. Afternoon visit Tamshing Lhakhang and then Kencho Sum Lhakhang. Day 10: Bhumtang - Tongsa. Morning visit Dairy Firm then drive to Tongsa, lunch will be at the hotel. Overnight at tourist Lodge. Day 11: Tongsa - Thimpu. Morning drive to Thimpu. Stroll in Thimpu for shopping. Day 12: Thipmpu - Paro. Morning drive to Paro and Simtokha Dzong the oldest in Bhutan. Day 13: Paro Departure. After breakfast transfers to Paro airport for your onward journey. Or, Paro to Kathmnadu and then transfers to Hotel and free.